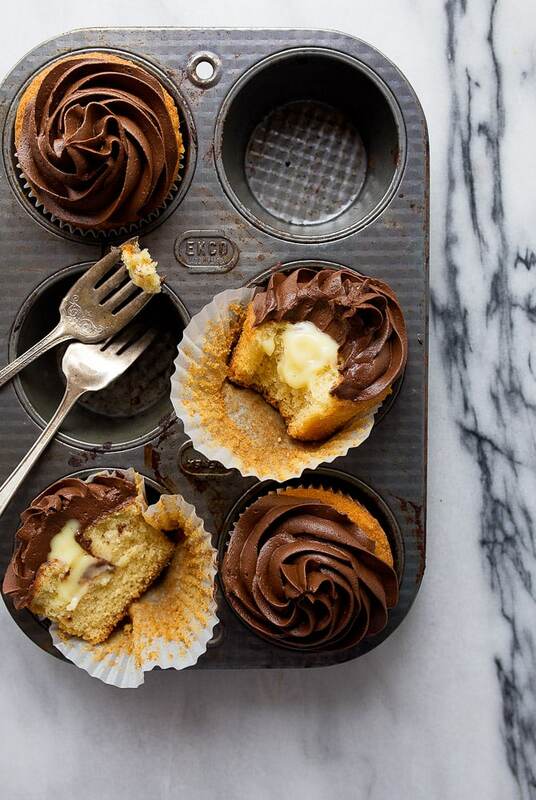 Boston Cream Pie Cupcakes for two. 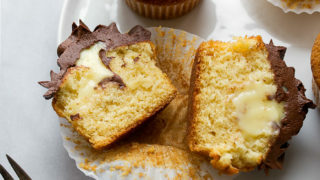 A small batch cupcake recipe for Boston Cream cupcakes; recipe makes just 4 cupcakes. I dripped Boston Cream Pie filling on my shirt, not once, but TWICE while eating these cupcakes. Usually, after cream filling from a cupcake drips on your shirt, you vow to be careful with the remaining bites. I was not. I ate with abandon. I didn’t care that I had already potentially ruined my shirt. I just kept eating and eating. I had 2 cupcakes, one right after the other. (And then I pushed a stroller uphill to the park, heh). These are so very good. If we really take a deep look at Boston Cream Pie, it’s easy to see why it’s one of the best desserts on earth. It’s made up of a vanilla cake, vanilla pastry cream, and a chocolate ganache frosting. It hits all the flavor profiles of vanilla and chocolate at the same time. It’s tender cake, creamy filling, and rich frosting all at once. What else can you ask for in a dessert, really?! I have a little secret to share. 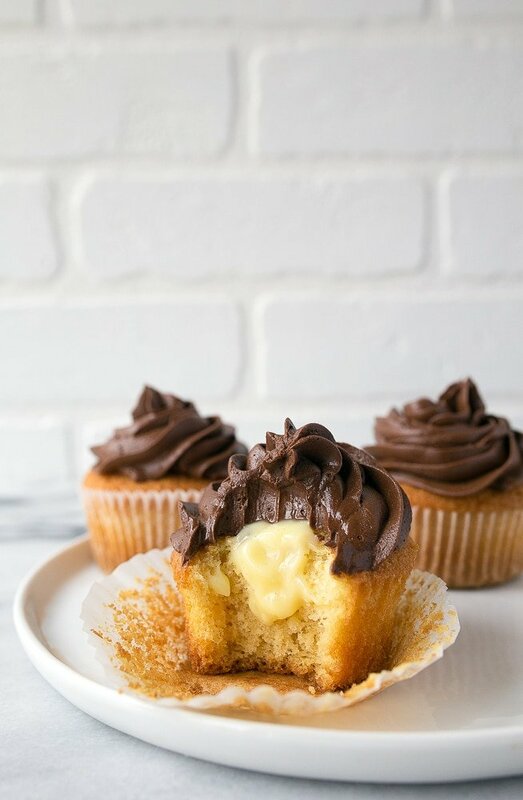 When I dreamt up these Boston Cream Pie Cupcakes (I decided to make cupcakes rather than my usual mini cake in a 6″ pan because I wanted swirls of frosting), I planned on making the small-batch pastry cream from my small batch eclairs to stuff them. But, I did something naughty. I bought a box instant pudding instead. I feel a little guilty, but it wouldn’t be right to spend over an hour making 4 cupcakes that will be eaten in 4 minutes. It felt right to take the easy way out. I saw at Target that Jello is making these new ‘natural’ pudding mixes, and something about the packaging just lured me in. (No, this isn’t sponsored in any way, but this is what I’m talking about). The mix says to use 2 cups of milk, but I used 1 1/2 so I would have a thick pudding closer to pastry cream. I don’t regret it! The thing is, you can’t not smile while eating these cupcakes. And you also can’t over-do it because the recipe only makes 4 cupcakes. You don’t have to say it. I know I’m your girl. Boston Cream Pie Cupcakes, small batch. Divide the batter between the cupcake liners, and bake on the middle rack for 16-19 minutes. When done, the tops will spring back, and a toothpick inserted will come out clean. Meanwhile, make the cupcake filling by whisking 1 1/2 cups of milk into a box of instant vanilla pudding. (The box will call for 2 cups of milk, but only use 1 1/2 for a thick cream). Add the pastry cream to a pastry bag fitted with a large round tip. Insert the tip about 1/2" into the cupcake, and then gently squeeze some of the pastry cream inside. Watch the surface of the cupcake, it will inflate slightly. Repeat for each cupcake. You will have leftover pastry cream if you used the pudding mix. Finally, make the frosting: in a small bowl, add the chopped unsweetened chocolate. Microwave on 50% power for 30-second increments until smooth and melted, stirring between each session. In a medium bowl, combine all of the frosting ingredients (including the melted chocolate) and beat on HIGH with an electric mixer until light and fluffy. Frost the cupcakes with the frosting (using either a spatula or pastry bag) and serve immediately. 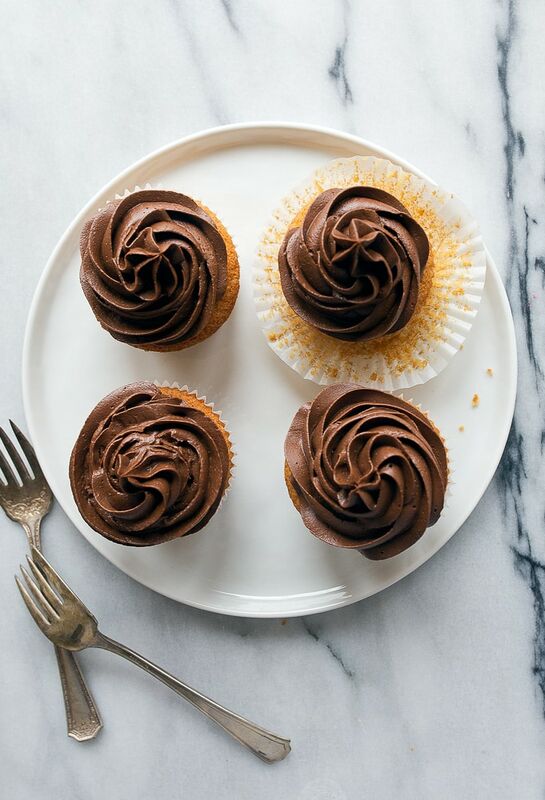 Leftover cupcakes should be stored in the fridge, but let them soften at room temperature for about 15 minutes before serving. The BEST!! I love Boston Cream pie and these cupcakes look beyond gorgeous!! the first time i had boston cream pie was for one of my birthdays during middle school, when a friend made me some, so i always feel super nostalgic whenever i see it. these sound delicious and i’ll have to make her some when her birthday rolls around! My parents both grew up in the Boston area and I grew up on the Cape- so many Boston Cream Pie memories. The cake itself is great, but boston cream DONUTS? So good. I can vividly remember making my Dad a Boston Cream Pie for one of his birthdays when I was little…it wasn’t until I grew up and traveled outside of Massachusetts that I realized boston cream pie is a weird, local dish. I mean, it’s neither pie nor topped with whipped cream. But, its SO good. I can’t wait to try out this small batch of cupcakes! I know I don’t have to say it but I really want to..you ARE my girl! : ) Just love this! 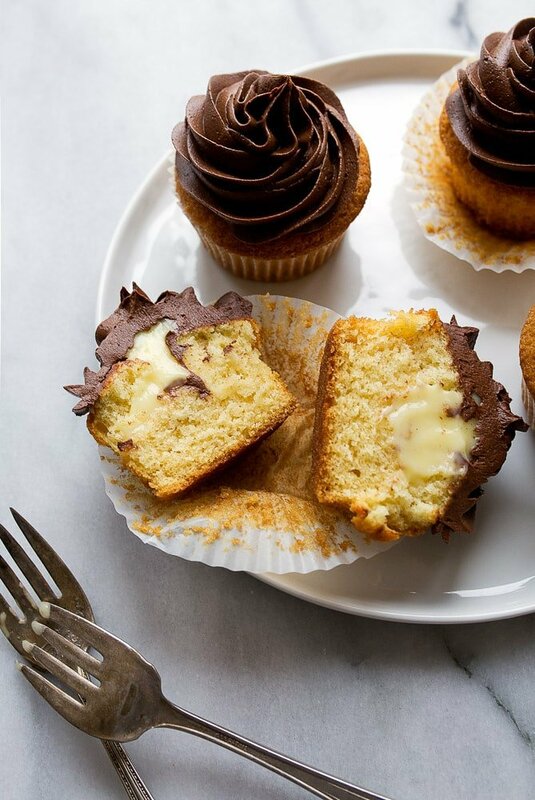 Christina – do you know Martha Stewart’s Boston cream pie cupcake recipe? I’ve been eyeing that for so many years but just don’t need/want 18 cupcakes, or even 9. This is awesome. You really rock! I gotta try next time I buy sour cream…or maybe this is the reason I needed to go get some sour cream! Have a fantastic week! Yeah!! I am so pleased to see this recipe. I would like to try it in my 6-inch pan….do you think the filling is firm enough to withstand the weight of half the cake over it? I’m sure mine was not the only request for these but I feel like this post is just for me….THANK YOU!! Awesome! Love this! I second the question about the 6-inch pan. Also, I am loving the jell-o natural puddings and jell-o…I don’t know if i am crazy but they just seem to taste better. :-) I’ve made them a few times already….especially the banana pudding. :-) Keep rocking out the wonderful recipes, Christina!!! I have scaled a full-size BCP recipe to the 6″ pan, and it was wonderful! I have a picture posted in Instagram at @scotch_scones. Definitely gonna try this. Love the antique muffin pan. Are cups jumbo or regular size? Boston Cream Pie is my FAVORITE!!!! I’m so, So, SO happy to have a small batch recipe (I could totally do damage to a large batch…..) Thank you for the recipe! Awesome, it looks nice and delicious, I love cupcake especial chocolate. Thanks for sharing the recipe! I absolutely love Boston cream pies. I want to start baking soon.. so what would be your suggestion for a first time baker to look for in an oven if buying for the first time? Any suggestions would be appreciated. OMG , you are soooooo the girl! Lady, I bow to you! I had been sulking because I wouldn’t make my favorite recipes because they were family size. I knew if I made them, I would nosh ’til gone! Unfortunately, my taste testers are not nearby. I had considered starting a Foodie club and THEN I found your website! I can’t wait to try your recipes and have already shared your site with others and added you to my dessert board. I am one happy chick right now. Hello. Where can I buy cocoa butter? Finally! ???????? I requested this recipe years ago! you’re a girl after my own heart-sometimes food is too good to worry about silly little things like spillage. These cupcakes are FLAWLESS and I love that filling sooo much! These look amazing! If I only have extra bittersweet chocolate on hand, can I substitute that for the chopped unsweetened chocolate? Should I then cut some of the other sugar out of the frosting recipe? Thanks! So looking forward to these tomorrow. Actually, I just went ahead and purchased some unsweetened baking chocolate! Lord knows I’ll need it again sometime soon : ) Looking forward to these! When I made this recipe the frosting was waaaay to thick, I followed the instructions to a T and it came out bitter and hard. What did I do wrong. I just made the cake part and to me, the taste of the baking soda is very strong. Can less be used? Hi Zoosie, I’m sorry about this. Did you measure exactly? I’m also wondering if you used extra salt? I have made many of your recipes Christina and have loved them all. Just wondering if I wanted to make a 6” cake instead would I need to double the recipe? This is the first internet recipe that was easier than it looked and tasted even more fabulous than it sounded!!! Thank you! Do you have a recipe for the filling that doesn’t use pudding mix?The pudding ingredients still look iffy to me. More additives than I want. Maybe one for the 6 inch pan.